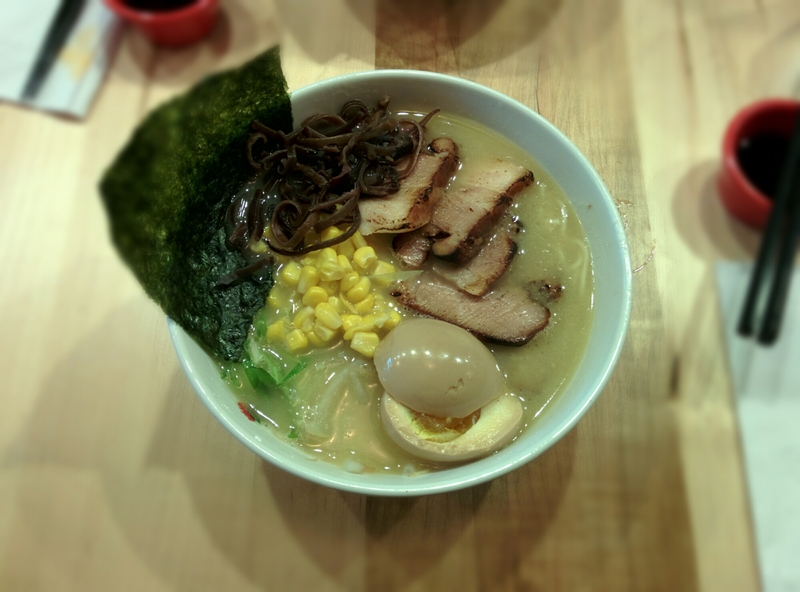 Totto Ramen is the new ramen kid in town. The May 3rd opening was much anticipated by many ramen lovers because it is an offshoot of a very popular Japanese ramenya in New York city but this location is owned and operated by a former lawyer named Nghi Nguyen. This ramenya specializes in paitan ramen, whole chicken and soy sauce based broth. 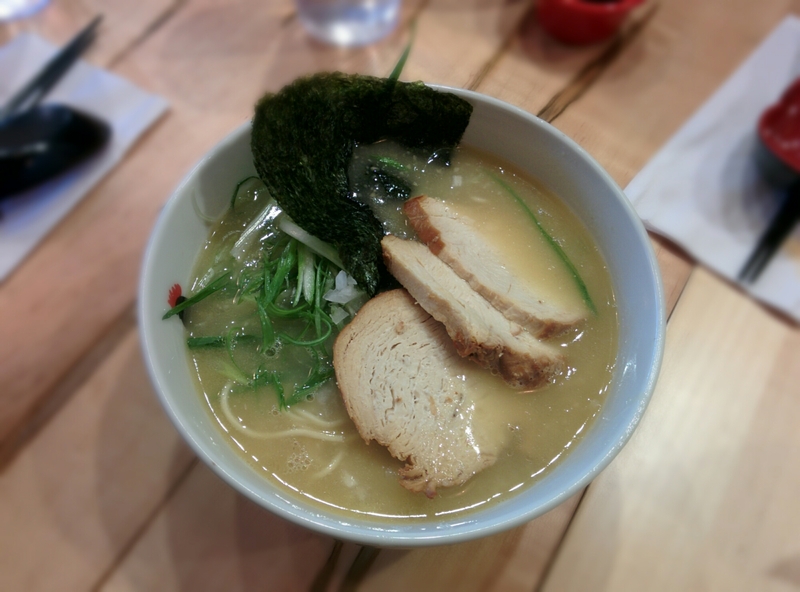 Totto Ramen is only one of two places in the greater Boston area that gives you the option of adding on chicken breast instead of pork. We arrived at six thirty in the evening and only had to wait thirty-five minutes to be seated after we gave our names to a host inside. We were very lucky that we did not have to wait long because many others have reported long wait times. There is no waiting area inside, so be prepared to wait in a queue outside. It is my observation that parties of one or two people get seated much more quickly here because they can get spots at the bar versus people with three or more who have to wait for a table. Above is the original chicken paitan ramen with extra char siu chicken on the side. It comes with straight noodles, scallion, onion, char siu chicken (or pork), and a nori. In the picture above is the spicy pork paitan ramen with an extra side of char siu pork. It comes with straight noodles, rayu, scallions, char siu pork (or chicken) and a nori. I asked them not to serve me bean sprouts and added on a whole boiled egg, sweet corn, and mushrooms. The paitan broth was flavorful and complex. It was rich, creamy, full of body and not over right combination of meat and fat. The char siu pork made my ramen taste quite delicious. The pork is charred by hand with a blowtorch before serving. The pork isn’t over fatty at all, just the right combination of meat and unctuous fat. I got to try a piece of my companion’s char siu chicken and that was pretty good, not dry or too small of a portion. The noodles were slightly overcooked and not as al dente, chewy or “QQ” as I would have liked. They use noodles from Sun Noodle, who also makes Pikaichi’s noodles. You can choose straight white or wavy yellow noodles, but they don’t tell you that when you order. My boiled egg add-on was very good. It had a perfectly soft boiled yolk inside which only added to my ramen experience. I do love a good onsen egg! The rayu, spicy sesame oil with blackened crushed peppers, was not spicy enough. This is a matter of taste, as most Japanese do not eat very spicy foods. It was a very subtle kind of spicy that allowed the richness of the paitanbroth to still be balanced and shine. Being Southeast Asian, I adore very spicy foods and am accustomed to having a side of chopped chilies or Sriracha on hand. My dining companion really enjoyed his chicken paitan ramen as well. Given that he doesn’t normally consider ramen as one of his favorites, it’s high praise when he says he wants to come back again. Overall, we really enjoyed our ramen experience here, if we are only talking about the ramen itself. However, when you factor in how we ordered extra meat and had to remind the waitress to bring us the side orders, it’s clear this ramenya is still going through opening pains. Totto needs to work out all the consistency issues, especially regarding the food and customer service. I hope these are addressed as soon as possible. Consistency is key when you want your customers to return and rave about your ramen via word-of-mouth. I want Totto to be a successful Allston business as they have been barely open for one month. I wish them much success in the future and look forward to coming back to try them again, particularly the spicy miso ramen with the wavy yellow noodles. Please note that Totto Ramen is only open for dinner at this time and only accepts cash. There is a Bank of America ATM across the street, so be prepared.